Q: How Do I Delete Keywords? Q: How Do I Bulk Add/Delete Products? 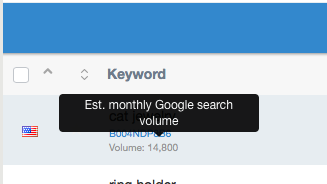 Q: Where Does The Search Volume Come From? Q: Is There a Downloadable Version? Q: How to Take Your Exported Data and Make it Useable? Click on "Rankings" in the menu on the left. Click on the product title for which you'd like to remove keywords. Select the checkbox against the keyword/s you want to delete. Click on the 'flag' icon to show the individual checkbox against each keyword you want. Click "Delete Keywords" at the top of the page. There is no way to bulk add products via uploading or bulk delete products! You can bulk add products by entering the individual ASINs into the 'Add Product' box. However we don't have the capability for you to upload via a spreadsheet or cvs file. If you have added too many products to your Rankings tracking and you'd like to delete some, this needs to be done one at a time using the 'trash can' icon against the product listing. The keyword volume is take from Google search result data. So the higher the number, the more searches that phrase has in Google. These figures are there to help guide you as to what might be a good keyword to target. Higher volumes are generally more competitive, so it may be harder to rank for them. It might be better for you to go after some 'low hanging fruit' as they say, and seek to rank for less competitive keywords. We give you the data, it's up to you to utilize it. Click on the product title. This will reveal the keywords underneath. Individually check the box you want, if not all of them. A pop up window will give the option to chose dates. Select date or leave as the default. Click on 'Export' from the pop up window. This will reveal the data but will look pretty unreadable. You can copy and paste this data into a spreadsheet program such as Excel or Google Spreadsheet in order to read it more easily. The the screen where the data has opened click on 'Edit' on the top of your browser window. Click 'Select all'. This will select the data. Then go back to 'Edit' menu at the top. Open Excel or a spreadsheet program. Then select 'Paste' to add the data. Also you can setup a regular email report if you find you want this data sent on a regular basis.